From the very moment that Tom Swift Jr. agrees to help the government of Ngombia build a highway to link the jungle-separated provinces of the new African nation ñ a task that has stumped the best engineers in the United States ñ he is beset by mysterious attacks aimed to defeat the project. Construction of the road is urgent. At stake is the economic future of this friendly country. But no conventional highway will do. For existing engineering methods can not be used to bridge the seething, bubbling swamp in the rain forest. Tom comes up with an amazing scientific solution to the problem ñ an aerial highway over the jungle at treetop level, supported only by invisible repelatron beams. Deep in the jungle, fantastic-sized creatures ñ throwbacks to the dinosaur age ñ and an eccentric scientist, missing for twenty years, add to the harassment's besetting the Swift work crews. In a series of dangerous adventures, Tom must outmaneuver the sinister forces working against him and the Ngombian government, win the trust of the hostile scientist, and carry through the skyway to a successful conclusion. There are two main inventions in this book: the Graphicopter and the Repelatron Skyway. The Graphicopter, which is pictured on the book's cover, is basically a computer controlled helicopter that can be used for fire fighting, skywriting, pouring cement, or anything else that requires great precision and maneuverability. There really isn't very much to a Graphicopter, so I'll get on to the next invention. 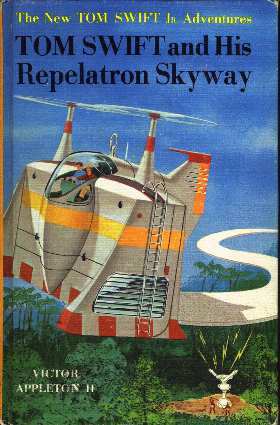 The Repelatron Skyway is really what the entire book is about. Basically, Tom needs to find a way to quickly and cheaply lay a road through the dense jungles of Ngombia. Rather than hack his way through the jungle, as most people would do, Tom adapts his amazing repelatron technology and creates a road that flies 200-300 feet above the jungle floor. "Dad, Iíve just figured how to lick our whole problem. Instead of running a road through the jungle, weíll build an aerial highway above the treetop level!" Both Mr. Swift and Mr. Newton were astonished. "Iím afraid that I donít follow you, son." Tom went on enthusiastically, "By running the highway above the trees, we can sidestep the mess of hacking a route through the jungle!" "Great, but how do you intend to support this aerial highway?" put in Uncle Ned. "It certainly canít float in the air!" "Thatís just exactly what it will do," Tom explained. "The roadway will be made of strong but featherweight material, supported in mid-air by repelatron beams ñ the same kind of repulsion rays used in my moon ship and atomicars!" Grabbing pencil and paper, Tom pushed back the luncheon dishes and began sketching out his idea. The rays to hold up the highway would be generated by repelatron transmitters, planted at widely spaced intervals. Installing these would be a much cheaper and easier job than building a continuous highway through the jungle. Tom felt so confident that he plunged into work that afternoon on the job of inventing a suitable roadway material. He decided to use Durafoam ñ an air-celled adaptation of his amazing vacuum-celled Durabuoy plastic. This would be reinforced with fibers of Durastress, the fantastically strong and rigid material he had invented to contain his midget atomic dynamo. "Hereís the info on the repelatron transmitters for my aerial highway," Tom said, showing them some sketches. "The transmitters will be spaced at half-mile intervals. Iíll need half a dozen built for my pilot test." The transmitter units would stand about ten feet high. Each one had a bell-shaped base. From this, a column arose which flared into a fan-shaped opening at the top. "Letís take it part by part," Tom said. "Down in this bell-shaped housing at the bottom is one of my midget atomic dynamos. It will generate the power for the transmitter. Tom went on to explain that just above this, inside the column, was the leectronic apparatus of the repelatron itself. "The rays which support the highway," Tom continued, "will be beamed out through this fanlike opening at the tom. Theyíll sweep back and forth thousands of times per secondóspreading out in a wide enough arc to support a half-mile span of the highway. "What about these tubes sticking out on each side of the unit?" Hank put in. "Theyíll project rays to the right and left of the highway. And these rays will be reflected back toward the highway, so as to lock it rigidly in position and keep the span from swaying from side to side." "How are the rays reflected?" Arv asked. Tom produced another set of drawings. "By means of these twin-horned reflectors. Theyíll be bracketed to trees that have been trimmed." The sweep beams, Tom concluded, would support the highway at an elevation of over two hundred feet ñ enough to clear the highest trees. Meanwhile, Tom went off to the hangar to convert one of his graphicoptors for the road-laying operation. The foam plastic would be pumped out through a road-width slot along the base of the copterís storage tank. Chow, who had come in, watched Tom weld a part of the graphicoptor assembly in place. He asked about the newfangled road layer. "Itíll squirt out the highway as if we were squeezing it out of a giant toothpaste tube," Tom explained. "Brand my bridgework, thatís plumb remarkable." Chow looked awed. "You ainít fixiní to squirt out the whole highway in one swoop?" "No. The graphicoptor will only hold enough mix to lay about half a mile per load. But each section will bond automatically to the preceding span as the plastic hardens." Tom added, "I have two flying supply tanks on the drawing board ñ ëhelitanksí, you might call them ñ for refilling the graphicoptor in the air. They arenít built yet, so for my demonstration Iíll refill from tank trucks on the ground." Highways would also tremendously benefit from this technology. It currently takes years of work to design and build a highway ñ but you could build a skyway in mere weeks. If the transmitters were mounted on the underside of the road you wouldnít need to bother with what the local terrain looked like ñ you simply mount your transmitters on your road, put your road in place, and there you have it. Roads, then, could cheaply and quickly be built to fantastically hard-to-reach places. In fact, you just might be able to build a road from Earth to the Moon ñ although what practical use that road could be I really donít know.